Sam Stosur was knocked out of the WTA Wimbledon warm-up event in Nottingham after suffering a straight-sets defeat by Katie Boulter. 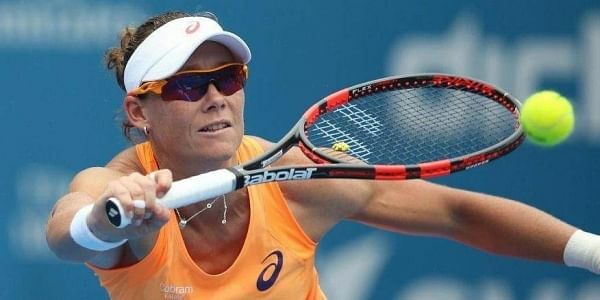 LONDON: Australia's former US Open champion Samantha Stosur was knocked out of the WTA Wimbledon warm-up event in Nottingham on Thursday after suffering a straight-sets defeat by Britain's Katie Boulter. The British number four reached her first WTA quarter-final with a 7-6 (8/6), 6-1 win over Stosur, the champion in New York in 2011. It was one of the most significant victories of the 21-year-old's career, who has been on an upward curve in 2018 as she looks to improve on a world ranking of 156. Boulter face either top-seed Ashleigh Barty or China's Duan Ying-Ying in the last eight. "It's really exciting," Boulter told Eurosport. "It's a huge step for me. She's a Grand Slam winner, and it's the first one of those that I've beaten. "It was a really quick second set but I dug in really deep in the first. I thought I held my nerve really well and found a way to win." Boulter will not be the only home hope in the quarter-finals after Johanna Konta won through in an all-British contest against Heather Watson. Konta and Watson have long been Britain's two leading female tennis players and, as in their previous WTA meeting in Indian Wells last year, it was Konta who emerged victorious on a day when a blustery wind made conditions difficult. Although Konta won in straight sets, 6-4, 7-6 (7/5), she was 4-1 down in the second before edging the tie-break. "One hundred percent it was not easy and conditions made it that much harder," said Konta. "It's never easy to play a compatriot. I just tried to keep my focus on my side of the court. "I feel fortunate to come through, there was very little in it." Fourth-seed Konta, who reached last year's Nottingham final, will play Slovenia's Dalila Jakupovic in the quarter-finals.